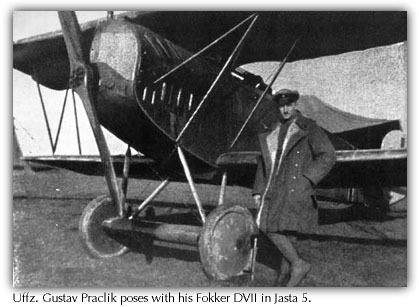 Editor's note: While L. Havill Smith, KC, (The subject of Part 1 of this article) struggled with a declining clientele during the lean years of the 1930s not long before Hitler's hoards began to ravage Europe, a former Jasta 5 pilot, Gustav Praclik, had his WWI memoirs published by the J.G. Oncken Company in Kassel under the title Unter Stahlhelm und Fliegerhaube. Few copies, if any, of this 1936 publication reached Canada. If they had, and if someone fluent in German-perhaps a friend or former veteran--had brought the book to Smith's attention, the riddle concerning the fate of his German adversary all those years ago on that October 1918 morning would have been solved. In 1992, Adam Wait, a fellow enthusiast as well as an exceptionally talented German-language translator, provided me with portions of Unter Stahlhelm und Fliegerhaube which depict Praclik's last sortie in WWI. To provide a view from the RAF perspectiue, I have added applicable footnotes and for the sake of clarity and to retain the liveliness of the original, some of the German ex-WWl pilot's more extraneous musings have been deleted. We resume our story at Villers-sur-Nicole on 25 October 1918. At this stage in the conflict the unbroken. German frontline is being drawn back in stages almost daily. What follows is Praclik's own, narration of the events. "The sector assigned to us between Solesmes and LeCateau runs almost exactly in a north to south direction. The Oberleutnant is in Berlin, where a new fighter aircraft which is especially manoeuverable and with an especially high rate of climb and of yet higher horsepower, is to be test flown. Great value is placed on Schmidt's judgement and he too has been ordered to our nation's capital. The early patrol is the task of our sister Staffel belonging to the same Geschwader. For this reason we get to sleep in, for once, until 7 o'clock. We have breakfast with coffee in the officer's mess which we have set up in a nicely situated old mansion. About 9 o'clock the machines are to stand ready for take-off on the field. We've never had any problems with the mechanics. The Oberleutnant is a good and clever officer and the pilots especially stand firmly by him. There are seven of us. Staffel commander. He is not the highest ranking pilot amongst us, but has served the longest. The strictest hierarchy is formed according to the rule: He who came first, comes first! We stagger ourselves as follows: the commander outside to the right; Unteroffizier Leicht, outwards to the left; Unteroffizier Praclik: and thus follow the others. Gefreiter Lehmann closes up. The 150 h.p. engines of the seven machines aligned in front of the tents throb lightly. Each pilot thoroughly tests his crate, tries the controls, and races the engine. Too much is at stake and a bit of carelessness could wreak bitter revenge later on. The conclusion: Everything is in order. All clear" I call out to both my mechanics. Now where is Hilber, anyway? The most reliable one is missing! "Taxi her out!" -Then the missing man appears from out of a tent and comes towards me gasping. He's holding a bundle firmly clasped under his arm and is waving like crazy. I throttled back. Herr Unteroffizier, Herr Unteroffizier, don't you want to take the 'Ober's' parachute along? After all, he's in Berlin today, so why should the thing lie around here unused? Who knows whether you might not need it?" "Don't be ridiculous, Hilber," I reply somewhat irritated. "What should I do with that thing? Up till now I've never needed a parachute and I can also manage today without it." But the faithful man was already standing beside me on the wing. While my comrades are taking off one after another and taking Staffel formation in the air, Hilber is strapping the parachute to myself and the machine. A parachute! That was a problem back then in the air service. From the beginning, a transfer of the open parachutes used in captive balloons to aircraft was out of the question. They would have popped open immediately. For a long time attempts had been made up till now without entirely satisfactory results. The following conditions had to be fulfilled: It had to use up the least possible amount of room, detach itself reliably from the machine during the jump, and open up with equal reliability. That sounds simple enough and yet was extremely difficult. At the beginning of 1918 the Heinecke system was introduced, which met the conditions to some extent. In spite of this, many failures were recorded. 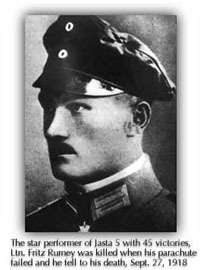 Just some weeks before the Staffel had lost Leutnant Rumey, a recipient ofthe Pour le Mérite . The reason for this was that he suffered a wing failure during a dive with his engine at full revs. His parachute did not open. Many engage us in open combat except with great numerical superiority. We had always initiated combat and stood our ground. Admittedly it will be hardly possible for us to attack today. A difference of 500 meters between 4,500 meters and 5,000 meters overall height, can't be made up. One must, for the time being, direct one's attention towards not giving the Tommy an opportunity to make use of his advantage in height. The two formations trace their paths in a leisurely way. When they fly above and below each other, respectively, we greet one another. In the meantime no one considers revealing an opening to the enemy! In the same second that we turn from a north-to-south course to a south-to-north course, the English turn from a south-to-north to north-to-south course. And this is of decisive importance. Just as for the individual fighter pilot, the highest rule of conduct for the Staffel is: Always show the opponent one's bold front, never one's open back or the difficult to defend flank! The needle on my altimeter nears 5,000. The clock indicates almost exactly eleven. The sun is already low in the south. The next time it will be our turn with the-to-south stretch and we will turn our face towards the sun. A serious disadvantage! Did the glaring mid-day light blind our patrol leader? Or did his attention, as happens with every mortal man, lapse for a fraction of a second? It is enough! He tips a heartbeat too late into the opposing turn, sees the English flying already en blee on a south-to-north course and employs all means to catch up. He turns his machine around 180 degrees practically on the spot. Around to the left! That's my inner turn which I, with only the same means, cannot execute any more sharply than he. A thoroughly precarious situation! Through a short roll and an adjoining loop I attempt to compensate. For a second I hang--completely isolated--my head pointing earthwards with my ever so vulnerable underside turned towards the enemy above me in the air, just challenging him to attack. He doesn't need a second invitation! He has made skillful use of our short moment of disarray and shot down like a hawk upon its prey. The leader first has contact with me, who had necessarily become the furthest separated from my comrades. And thus my fate overtakes me. A whistling burst of fire, while fired from above, flies, with respect to my upside-down position, from below obliquely into my machine. All around me there are flashes and reports and sparks fly. I feel a stabbing pain in my backside, then the left glass of my goggles splinters, while the eye itself is instantly blinded by a stream of spurting blood. It's a miracle that the tracer bullets didn't immediately start a fire! Finally I have regained a normal attitude. My opponent swings around for a second blow. This time he won't find me defenceless. But where are my comrades? My eye is met with a confused swirl of several machines. And the Fokkers appear to be in the minority. Later on the following was established: In the same sharp turn, the low-lying seat supports built onto the tank collapsed under my rear-guard, Vizefeldwebel Böhm. He was therewith forced to give up combat. The novice Gefreiter Lehmann had taken off. He wouldn't have been of much use anyway in the hopeless confusion. So, excluding myself, there were only four of us remaining. Although the Tommies had seemed assured of victory through their so unexpectedly successful attack, they had their hands full just trying to protect their own skins. 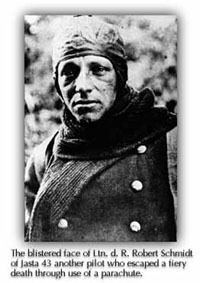 That they didn't entirely succeed in this, but rather the bold English leader, of all people, was eventually cut off, forced down behind our lines and taken prisoner, might be noted as proof of the superior combat skills of German fighter pilots even under the most unfavorable of circumstances. So I had to join my comrades. Every machine gun counts twice as much in such cases of numerical inferiority. Then a glance in the interior of my machine reveals a more pressing danger than all the Englishmen combined. Two thin copper pipes, one on each side, are distinctly visible on the floor of the fuselage running from the tank to the motor. But on the left one a blue-green flame is playing merrily, fed by benzine spewing from bullet hole. Like a malicious gremlin it darts up and down with the change ofair pressure in the tank. Two centimeters away from the fuselage covering which consisted of varnished linen! A cold shudder runs up my spine. But then I immediately get ahold ofmyself. I'm still alive! The first and most pressing necessity is to extinguish the flame! But how? It's not possible to do so with my hand, because I'm strapped in and secondly the flame is so far forward that I wouldn't have been able to reach it even with more freedom of movement. There was only one solution: Drive out the Devil with Beelzebub. That is, in this case blow out the mischievous licking flames, with a strong current of air. So, my fine Fokker, show what your construction's worth! A human life depends on whether the wing spars and the bracing can withstand the most extreme stress! Downwards I go in a steep dive with the engine running at fullrevs! Its calm hum changes to a high-pitched singing, then into a trembling whine! For a long time already the tachometer indicator has gone over 2,000 to the stop-pin. The wind whistles in the bracing wires in the highest soprano. I literally feel the spars groan, the ribs bending in the wings. The air pressure on my body, especially my head sticking up above the fuselage, becomes unbearable. What use are all estimates such a wild chase in a time of rapidly succeeding speed records! Maybe it was 400, maybe it was 500 kilometers per hour. The aircraft, built for level flight speeds of 160 kilometers per hour, was loaded at nine to 16 times the norm. I must have dived like this for eons and eternities! A complete lack of air forces me to level out my aircraft. Only now, when the large-surfaced wings are to be turned from the previous to the new direction of flight, does the decisive moment draw near. An overly hasty pull on the control stick, from the necessity of being able to breathe freely again, a movement that's not entirely steady, and the machine will definitely crash. This manoeuver too succeeds! The motor drones the well-known song one has grown fond of and the tachometer swings comfortably between 1,300 and 1,400. Only my altimeter apparently has something wrong with it. It indicates 4,200 meters. That can't be right! I must be right over the ground! But all my knocking on the housing doesn't help. Slowly I also regain my sense of estimation. In fact, I only went down 600-700 meters in the dive. Yes, what was the cause for my aerial acrobatics? Oh,right! The flame! My gaze is directed inquiringly in the interior of the aircraft in the vicinity of the rudder bar. Everything's dark. Only a miniature fountain is moistening the left side ofthe fuselage and the floor. It smells like benzine! However, the flame is extinguished and I am alive. My buttock wound can't be too serious. Both of my legs will obey my will. Sure, my left eye is glued shut and a large portion of my field of vision has been therewith taken away, but one eye will do if necessary and my comrades are in urgent need of support. Aha, there they are! Swinging about in a wide arc, I am about to join them or get the attention of one of the Tommies whirring around. Then begins to unfold the most dangerous and at the same time one of the most remarkable experiences of this, up till now not exactly uneventful, war. Around my feet and legs arises a rattling and rumbling, a flashing and hissing from untimely exploding fireworks. My assumption that I could have come under the guns of a previously unnoticed opponent immediately proves to be wrong--it's my own machine-gun ammunition which is detonating in turn, according to how it's loaded in the belts and lying in the ammo case. Close behind the motor and almost on top of the fuel lines are the belt cases with their death-bringing incenidiary ammunition. A chute made of zinc-coated sheet-iron provides an unhindered supply of amniunition to the machine guns. Under the left ammo chute had been located the flame just extinguished and it had no doubt set some magazines on fire. The new source of heat is now transferring to the entire supply of ammunition in the left container. 500 rounds on each side 1000 rounds altogether! I didn't open fire once today. This means the end! I commend body, soul, and spirit, to your hands, God, and to mine at home! And now there's a spraying and hammering, then a hissing and pattering, a rattling and crackling. The power of penetration of the rounds aimlessly zipping and yet they completely suffice to tear up my legs and body and with the large number of steel-lead-phosphorus bees and their dangerous proximity the chances of my getting hit must be about one in 10 to 50, and if the other case is affected, 100 solid machine-gun rounds in my body!? Even if they haven't gone through barrel and rifling! Ah! Number one! In my right foot! This is the beginning of the end. There's still a rattling and clattering, it's still humming and clanking. And still I'm sitting, though wounded in three spots, in full possession of my spiritual and bodily powers in my faithful winged steed, which gives no thought to giving up the fight as long as it draws breath. Two, three times I call out "NowP and then a fourth time when in a fine, eerie stream a tongue of flame nearly a meter high shoots out and immediately sets the fabric covering on the left side on fire and thrusts out through the fuselage decking into the open air! I am "stinking"! The magazines explode, sowing destruction. The fuel line is spraying merrily and the slipstream is blowing strongly into it, although I let the crate sag properly. And now my pant-legs, torn to rags by my own machine gun bullets and soaked with fuel, begin to catch fire. First the left, then also the right. The hairs on my fur gloves begin to curl in the increasing heat. The right glass in my goggles cracks; the lattice of cracks robs me of all vision. And the the flickering blaze strikes me right in the face, which fortunately is covered by the leather mask for protection against frost. Away! Away! Get away from the fire! Just get away! Burning must be a horrible death! Out of the smoking machine, which is now threatening to become my funeral pyre! For a moment I lost myself! My purely animal survival instinct pulls at me. It defends against the violent destruction of my body and especially this grisly form of annihilation. I want to stand up! I must stand up! Won't anyone help me? I pull, rip, lift up, but don't get out. I'm burning! As a fresh gust of wind parts a bank of fog and creates a clearing, my calmness is restored, a calmness which allows me to think objectively and undisturbed. Fool that I am! I'm still strapped in! Here is the patent lock and what is this I have in my fingers? Why this is--this is the parachute harness. I have a parachute!? unconsciously it strikes me as an incomprehensible act of providence. Indeed I have never practiced a parachute jump, but I don't doubt for a second what I have to do. Most of all I have to make sure that I get clear of the aircraft and the dangerous control wires, which run partly outside of the exterior skin, with the parachute pouch. Quickly I stand with one foot on the wing; Hannover was a good school. Now I'm down-hearted! The flames flare up high in the increasing slipstream and leave behind a pitch-black smoke. Now the elevator is torn up steeply. The machine obstinately rights itself, appears to stand-then I let go, jump sideways towards the rear. The wing allows for a firm jump. Then it becomes dark. A tug under my shoulder and a feeling as though someone wants to pull my skin up over my ears brings me to myself. I am spirited and am hanging squeezed like in a vice, but otherwise without any sensation of pain, in the parachute. The smouldering fire in my overclothes is extinguished. Whit the tug from the opening of the parachute, the glass splinters from the goggle frames have flown out and I can see at least with one eye again. The parachute chords stretching out fro the weight of my body calmly sway back and forth. And-however unbelievable it might sound-now begins, not just from a professional perspective, the most beautiful flight of my life, which ever since has become to me an imcomparably great metaphor of the lifting, carrying, and rescuing nature of God's eternal arms. If in motorized flight nothing is comparable in beauty to a glide from great heights, if, undisturbed by the clattering of the engine, the rushing of the wind and the song of the harp, which it conjures from the bracing wires, envelope the pilot and seem to carry him away from the earth, which in reality he is quickly nearing-so also in a flight in a parachute, its stillness, its imperceptibility, and its solitude, an unsurpassable experience! What is time measured against events taking place? Even here on the ground subjective experience measures differently than a clock. For me at least, eternity is no longer unimaginable. Because all that I had experienced up to now had taken up no more than five minutes at the most, taking place in imcomprehensible speed and yet impressing itself sharply upon me. 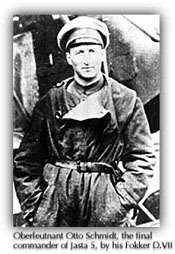 On October 25, 1918, about 11 o'clock in the morning, I am suspended at 4,000 meters height, wounded three times, grossly mistreated, badly singed and yet again relatively safe in a parachute above France's soil. A great unearthly silence surrounds and fills me. God could have spoken then. The first clear thought which I have is my young wife. We are not only companions in life, but, thank God, also share the same convictions! I wonder whether she suspects at home that her husband just now is struggling with death in a dozen forms and that he now, exposed defenseless to all outer actions, placed alone at the mercy of God, is hanging between heaven and earth? Murderous reality tears me out of onsetting dreams. The sharp singing of an engine--that sounds English! Choppy machine gun fire! Not far at all from me the familiar series of little flames whistle through the air. Are they perhaps meant for me? Summoning all my strength, grasping the chest strap with both hands, I free my neck and head somewhat and can cast a glance obliquely upwards. It's hard to believe and yet it's true: the enemy patrol leader. Perhaps furious that his actual prey, the enemy soldier, has escaped up to now and certainly also because he, though greatly superior, can do nothing to my comrades, he attacks a defenseless, wounded opponent. For the sake of truth it should be emphasized here that this deplorable occurrence, in any event in aerial combat and in so far as we had fought with the English, was completely isolated. As a rule the Tommies were amongst our most chivalrous opponents in the World War. No sooner did I master my astonishment over the behavior ofmy former opponent, which was in contempt of all notions of chivalry, when a shadow passes over me. I see distinctly the big"T" on the side ofthe machine, but also from the behavior, which is unique to each pilot, I recognize Treiber, who's sitting on the Englishman's tail and doesn't allow himself to be shaken off." An overwhelming joy bursts within me. Am I not a lost man, at most an interesting showpiece in the course of events? Why should he risk his neck for a dead man? Treiber waves, but I can't answer. As soon as I free my cramped hands from the chest straps, the collar practically chokes me to death. Faithful comrade! My dear Treiber, you are to be sure not entirely without fault that I'm hanging here, but this is more than made up for now that I have learned that you will not leave me in the lurch, even when you are embroiled in deadly combat four to seven who want to dispatch me and you. More and more a continuous tearing and ripping from above penetrates into my consciousness. Now and then my descent also appears to speed up. During one of the pendular movements of the 'chute', which I try to reinforce by swinging the body, I briefly succeed in looking vertically upwards above me. There it arches above me, the parachute, yellow and plumply filled by the wind. But instead of the one hole in the middle, which is supposed to provide egress for downgusts of wind, I see a number of them through which the sky peers cheerfully. And these holes are in no way sewn on the edges. They have been, as it suddenly occurs to me ripped by the round that wounded me in the backside and which beforehand penetrated the tank and all the folds of the parachute packed on top of it. So on the one hand the parachute saved my life twice, because nothing ruins the power of a bullet as surely as a folded object. On the other hand, I am now exposed to the danger that these extra holes (there were seven of them) will rip larger and that as a result the rate of descent will climb too high and that in the landing all the bones in my body will be crushed. The sun is in the south. The large dark spot back there can only be the Mormal Woods and that lies behind our front. If only I might-no, I'd rather not!-land in the woods! With my rate of descent I could be struck back and forth in the tangle of the October branches! So, there is the south: the woods lie to the east. That much has been fixed upon. Out of the question! Indeed slowly, but incessantly, I am turned by the parachute upon my own axis. Hardly have I ascertained a point in the landscape and want to use it to find another in order with their help to find a third, namely the lines into which I'm being driven, when I've turned a quarter or halfway around and I've lost it. The level spot back there is no doubt an airfield. It seems to me as though I can recognize a landing arrow, perhaps even a windsock, just like the one that we have. I wince with intense alarm. During take-off our windsock had pointed rigidly towards the west! An easterly wind! That was the reason for such clear weather today. I must be driven straight behind enemy lines. Wounded, a prisoner, behind barbed wire? Anything, but that! My mind works feverishly anew. That misty heap of ruins must be Le Cateau! Or is it Solesmes? No, Le Cateau lies further to the south, more in the direction of the sun. Again that can't be right, because the Mormal Woods are waving from the side and the sun is warming my back. Today I estimate the duration of my descent at eight to nine minutes, which, the longer it tok, began more and more to resemble a freefall. 1,000 meters! I see rolling automobiles, people congregating. Details can't be distinguished. 800 meters! Now a huge shadow sinks over me. Again I hear a 150 h.p. engine roaring. A second time Treiber waves to me from his machine. My hands are as if lifeless. I can't answer, but a feeling of boundless relief passes through my heart. If Treiber goes so low without being fired upon,k then I must have been driven behind the German front. So I will escape the lot of imprisonment. And we must now have a west-to-east wind instead of the east-to-west wind of two-and-a half hours previously. Does not God make the winds into his angels? 500 meters! I recognize field gray uniforms and civilians and a camouflaged artillery position on the edge of the wood. If only I don't get carried into the woods! But even the seven bullet holes serve a purpose. My journey is getting faster, my descent more rapid! 200 meters! I feel a strong current of air from below. I feel like a tied-up sack being thrown from the garret'window of a tall granary. I pull my legs up to my body as far as I can. Instinctively my body tenses its muscles for the decisive defense. All the previous struggle against death now concentrates for a last desperate counterthrust. And with a dull "plop" I smack down on the resilient soil of the field and now really lose consciousness. Around 11:20 on October 25, 1918 near the small village of Sart-Bara, near Berlaimont, about 25 kilometers from where I was hit, near the French-Belgian border, in the zone of the Second German Army, was achieved according to my knowledge one of the first successful parachute jumps-but certainly the first successful jump with such a badly damaged parachute! So conspicuous was the event that even the Kofl (Kommandeur der Flieger) daily orders took notice of it and congratulated the otherwise nameless pilot on his successful landing. Unfortunately it wasn't possible to for me at the time to get a copy of this order. Successful landing? Momentarily the "lucky" lies unconscious in a French field, his head leaned against a fencepost, which upon impact, thank God, was only hit from the side. In the meantime Unteroffizier Treiber returned to Jasta 5, in order to report the "lucky" pilot killed, as according tohis opinion, not a bone could have been left intact after such an impact. Because of the many fence wires which divided up the fields, he wasn't able to land. But finally the safely-landed pilot raised his aching head. I see myself surrounded by a crowd of people numbering in the hundreds, soldiers and civilians. However only four or five artillerymen have ventured up to 10 to 12 meters away, who stare at this being from the third dimension in motionless astonishment. It's no wonder they were afraid because I must have looked something like this: My flying suit, which carried no rank insignia, was torn to pieces and burned around my feet and legs and higher up I was heavily blackened by smoke. Through the brittle blackened face mask and the empty frames of the goggles, peered over blackened lips on the left side, a dark brown lump and on the right side an eye, the lashes of which were burned off and the lid scorched. A pervasive burning smell didn't really invite closer scrutiny. In addition, none of the spectators knew whether I was a German or an Englishman, or whether I was dead or alive. The former was the more probable--and nobody likes to touch a dead man, especially one like that. Soon I had surveyed the situation. Although my whole body hurt, nothing especially serious could have happened to me. But seeing these soldiers, who were after all accustomed to war and horror, staring at me, provoked something in me and caused me to burst out with the words: "Don't gape at me like that, you numbskulls, help me. If only I hadn't said it! The five faces up with comprehension and they immediately made a goodnaturedly helpful and at the same time clumsy bear-like charge on me such as I had never experienced in four years ofwar. Three or four medics joined them and every one of them wanted to remove my clothes, examine me and dress my wounds. And my four rescuers nearly succeeded in "finishing" me off. A group of higher-ranking officers climbs out of a passing auto and one of them proceeds straight towards me, politely, with the question, "Can we be of some help, comrade?! Managing Editor's Note: Praclik was no doubt surprised at being treated in, this friendly manner by high-ranking officers, the Army of Imperial Germany being known for the rigid social distinctions that separated officers from the ranks. "I am just a non-commissioned officer," was the reply. "Nonetheless comrade!" he answered. "Should we take you to the field hospital?" "No thank you! I want to go back to my Staffel." Then I ask that they see to it that no more than two medics treat me at the same time and that all my belongings don't get taken as souvenirs. The larger items from my outfit are given back willingly. To my amazement and to the disappointment of all the participating field surgeons, the examination yielded few results: a negligible superficial burning ofthe face, a heavily bleeding, but light grazing shot over the subcutaneous fatty layer of the left eye, just under the brow; in the left buttock a bullet imbedded in the flesh, painful, but not dangerous; the poisonous phosphorus charge had exploded towards the rear into the parachute; finally, in my right shoe a machine gun round without rifling was found, the only one that wounded me during the explosion ofthe ammunition. The phosphorus had burned out on my instep and left behind blisters the size of a five-mark and a two-mark piece. This wound caused me some trouble, but I felt relief after it was bandaged.brought me a filled wine bottle and bade me drink. I did so greedily, once, twice. He forced upon me the contents of a third glass. And now that I found myself momentarily in safety, my nerves, which up to now had been tensed to an extreme extent, broke down. My limbs began to shake, my teeth began to chatter as in a chill. I wanted to begin crying for no reason at all, sobbed heavily, and then fell into blankets. Around 4 o'clock I was awakened by a veritable howling ofIndians. In a heavy half-slumber, like after anesthesia, I hear clattering shouting, and yelling--incredulous, dubious: "Praclik, man Praclik, you're still alive? You're really still alive?" All of my off-duty comrades: without distinction of rank, push into the small room, touching me, shaking my hand, first quite carefully, and then finally four of them, with sincere thanks to the Hauptmann , take me and stow me into an auto filled with requisitioned beds and blankets, cover me carefully and then slowly drive on. Beside me sits Treiber, who hlds my hand firmly in his and doesn't say a word. I am entirely at ease here, resting amidst the warmth and loyal camaraderie! I am unloaded at a private quarters and turned over to a little French grandmother as well as her granddaughter. They receive me like a son and a brother and the services which especially the twenty-year-old, devout-Catholic girl rendered to me in the following difficult days will remain unforgotten, I am certain, not only as long as I live on Earth. These were services performed in selfless devotion, without modesty or disgust, for an enemy of their country! During the next 20 hours I sleep without interruption like one who is dead from exhaustion. On the afternoon of the 26th of October, the doctor of the Geschwader visits me for a second time. My right leg is in unbearable pain. He lifts the blanket, shakes his head dubiously upon viewing the limb swollen red up to below the knee and murmurs, "Hopefully it'll turn out alright, Praclik! I would advise you to come to the field hospital" I don't want to. A sleepless night lies behind me. Piercing, gnawing pains in my foot and leg torment me. I ask to see the doctor. He appears immediately and hardly examines me, but rather forces haltingly through his teeth: "Praclik, your leg has to be amputed! Phosphorus poisoning! You know what that means!" I know only too well! He is referring to our Oberleutnant Schulte, who just five weeks before received a smooth flesh wound in the upper thigh. It would have been a "blighty" if he hadn't been wounded in aerial combat. In aerial combat one shoots with phosphorus ammunition, with malicious poison! I know only too well how this same doctor stood before him almost pleadingly and advised him to undergo amputation. Schulte stuck by his answer, "No" When three days later with a very high fever he said "Yes" , it was too late. Two days later autumn wind was blowing over his grave. Now it is my turn and in spite of a steeply climbing fever I too said clearly and definitely, "No!" Four times I had been wounded! Through four long years I had been spared the most horrible of all lots, that of a war-cripple! And now that the war was at the end? No! No! No! Never! Everything within his power? His power? My power? What a sorry circumstance it is, though it concerns a human life! In the most favorable case, it means the life of a cripple! Power! Power! If only someone had it! Lightly my young nurse slips over to my bed, gives me something to drink, and makes my bed again. And then she sees the misshapen flaming red leg with the signature of the Grim Reaper, the suspicious broad red stripes on my upper thigh, she whispers with tears in her eyes, "Monsieur Praclik, I have prayed to the Holy Virgin for you," covers me up with a soft hand and leaves me alone. As though someone had poured molten lead onto my afflicted leg, I groaned in raging pain. I became hotter and hotter. Sweat covered first my forehead, then my whole body. It was shaken with shivering until finally water came in streams from all pores and left beneath it distinctly visible traces. I feel a cold draft and hear again in half-slumber that dubious: "Praclik!? I must have been sleeping. The doctor touches me. Before the window I can make out indistinctly the outline of the ambulance. "Praclik," the doctor says, "you are a real miracle! And a multiple one! Just look here! It's a matter of your life, not mine." On the verge of my strength, I can't even lift my head anymore. The doctor helps me and there lies my leg, apparently far away from me, as though it no longer belongs to my body. And my leg looks downright human, the swelling has gone down. Only my instep is a bluish color and shiny, and there's a stabbing pain as if from a thousand needles. Both of my burn wounds are suppurating. "Praclik, you must have sweated an incredible amount! That was your salvation!" "No, Herr Doktor, " I reply, "I prayed! That was my salvation."